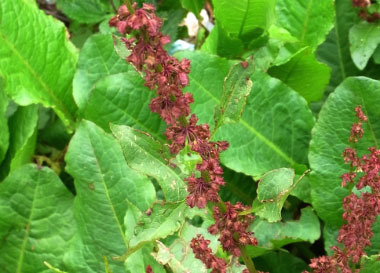 Nepal dock is a perennial plant in the Polygonaceae family. Interestingly, this plant regenerates from tap roots and establishes quickly as seedlings. Once established, tough tap roots become difficult to remove. This plant grows abundantly in many parts of Asia and Africa but in particular in India and Nepal. It is used by many for its astringent qualities and for dyeing purposes. Distinguishing Features: These are erect plants, usually with long taproots. The fleshy to leathery leaves form a basal rosette at the root. 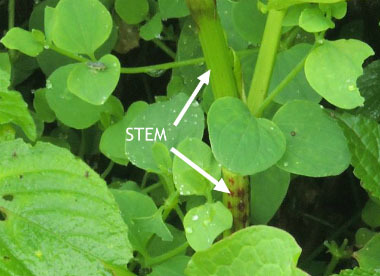 The leaves are wider at the base and become thinner as they grow up the stem. 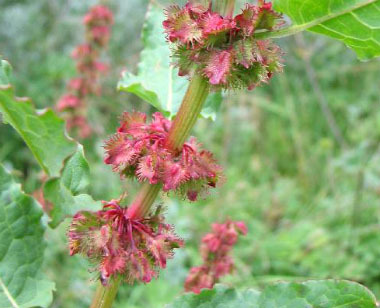 The flowers and seeds grow on long clusters at the top of a stalk. Flowers are somewhat brick-red and each seed is a three-sided achene, often with a round tubercle on one or all three sides. Flowers: The flowers are hermaphrodite and are pollinated by wind. It is in bloom from May to June, and the seeds ripen from July to August. Flowers grow in whorls forming long, nearly leafless racemes, and are reddish or green. They have 3 fruiting sepals, one large and two small, broadly ovate, fringed with comb-like, hooked teeth. Fields of Nutrition has medicinal benefits and vitamin/mineral content of Nepal Dock. Leaves: Lower leaves are long-stalked, oblong, ovate, petioled, base widely or narrowly cordate. Margins are slightly wavy. The fleshy to leathery leaves form a basal rosette at the root. The basal leaves may be different from those near the inflorescence. Height: This plant grows to a height up to 1.2 metres (4'). Habitat: This plant is commonly seen growing at higher altitudes (between 900 and 4300 metres) on moist as well as dry slopes (although it prefers moist soil). It is a common weed found in pastures, fields, grasslands, and in disturbed areas. Nepal dock grows in several countries from Afghanistan to southwest China. It is also found in Vietnam and Indonesia as well as Africa, mainly in eastern Africa from Eritrea and Somalia to South Africa. 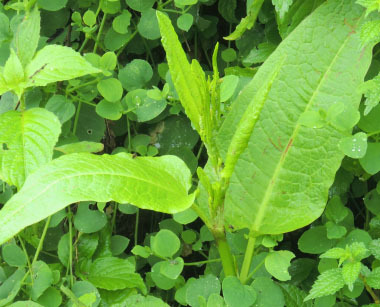 Edible parts: Young leaves and shoots are edible in small quantities due to very high oxalic acid content. 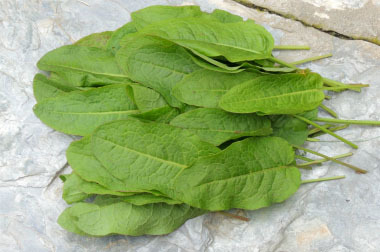 Many people enjoy preparing the leaves and shoots cooked as a vegetable because once cooked, the oxalic acid is greatly reduced. Roots are edible also when cooked. My sincere gratitude goes out to Yam Grg, a naturalist who resides in Nepal, for providing most of these images. Her passion for helping people is deep and very moving. Yam lives in Nepal and I am proud to have Yam as a friend.